Our 20" Rumple Garden Gnome from GardenFun is just so cute and charming that we can't wait to share him with our customers. This adorable top-selling design has that classic gnome look. His gray pointed boots are a perfect match for his impressive gray beard. Meanwhile, he sports a green tunic with a brown belt and the classic red pointed hat. He couldn't be any more traditional in his look, yet he's still a unique addition to any garden or yard. 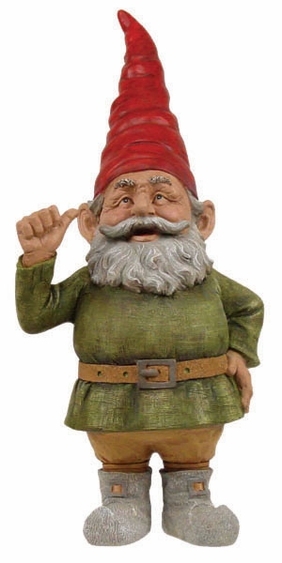 With Rumple Garden Gnome, you get a high-quality statue that's sure to last for years. He's made from weather-resistant cast stone resin and stands 20" tall. Let him go solo to be the highlight on his own or pair him with our other garden gnomes to create a cheerful little group.